These are the steps I took to compile Firefox so it can run on a RHEL shared hosting server which doesn’t have D-Bus installed and only has GLibc 2.12. Why would someone want to run Firefox on a shared host? Firefox can be run as a headless browser (without a GUI) in conjunction with Xvfb to automate interaction in web pages and take screenshots (similar to PhantomJS, but better). A shared host likely won’t have D-Bus installed, or even the required /var/lib/dbus/machine-id, and it cannot be created by an unprivileged user. Firefox doesn’t actually need D-Bus, but the official pre-compiled binary was compiled with a mode that requires it. The only option is to compile Firefox ourselves with D-Bus support disabled. If you have elevated privileges on the shared host, you can install dbus, or just do the following with a D-Bus utility: dbus-uuidgen > /var/lib/dbus/machine-id. Having your shared host create this file may allow Firefox to run. Here are the steps I took to compile Firefox on 64-bit CentOS (essentially identical to RHEL) with D-Bus support disabled, and get it running on a RHEL shared host. Unfortunately this shared host still uses GLibc 2.12 (introduced in 2010) so I had to work around that. To make the compiling easier without negatively affecting an existing system, obtain a VMWare image of CentOS 6.8 from osboxes.org. It already has Firefox pre-installed, but that installation will be removed. The VMWare image of CentOS doesn’t have internet enabled. Run dhclient -v from root to fix this. Also, be sure VMWare Tools is installed if you use the VMWare image of CentOS. In my case, I needed to verify the Glibc version with ldd --version to make sure it matches that of the shared host (in this case 2.12). Before going any further, it’s best to yum update all the packages. Running yum update on the VMWare image above may take a long time and could require 500+ MB. You may have to reinstall VMWare Tools afterwards. We’ll eventually, but not yet, run ./mach build from this folder and Firefox will be built in /tmp/firefox-49.0.1/firefox-build-dir. # Stripping is now enabled by default. # frequently when it is doing background rendering in a tab. Next we will need at least Python 2.7.10 installed because Firefox uses it in their build system. On my CentOS 6.8 VMWare machine the highest version that can be installed is 2.6.6. Use this command to install Python 2.7.102.
cd /tmp && yum groupinstall -y 'development tools' && yum install -y zlib-dev openssl-devel sqlite-devel bzip2-devel && yum install -y xz-libs && wget http://www.python.org/ftp/python/2.7.10/Python-2.7.10.tar.xz && xz -d Python-2.7.10.tar.xz && tar -xvf Python-2.7.10.tar && cd Python-2.7.10 && ./configure --prefix=/usr/local && make && make altinstall && export PATH="/usr/local/bin:$PATH"
Once Python 2.7.10 is installed, configure will report that it needs GCC 4.8 installed. 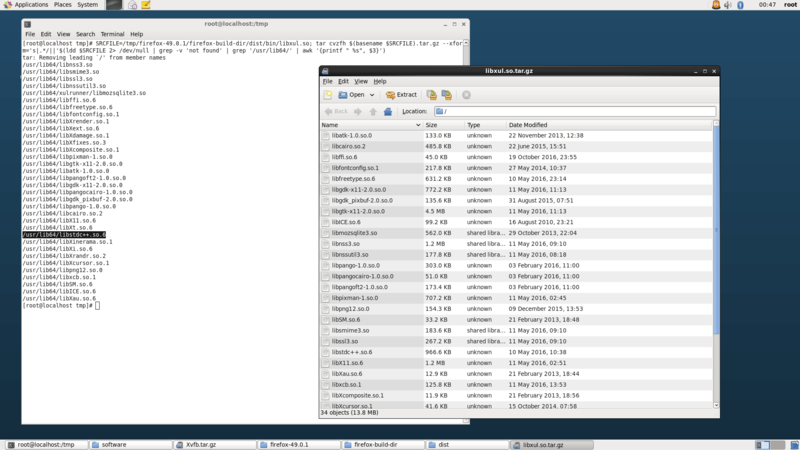 The GCC distributed with CentOS 6 is unfortunately only 4.4.7. Let’s work around that. ERROR: Only GCC 4.8 or newer is supported (found version 4.4.7). checking for libffi >= 3.0.9... Requested 'libffi >= 3.0.9' but version of libffi is 3.0.5 configure: error: Library requirements (libffi >= 3.0.9) not met; consider adjusting the PKG_CONFIG_PATH environment variable if your libraries are in a nonstandard prefix so pkg-config can find them. configure: error: Library requirements (libffi >= 3.0.9) not met; consider adjusting the PKG_CONFIG_PATH environment variable if your libraries are in a nonstandard prefix so pkg-config can find them. We need another side channel install to get libffi >= 3.0.9 on this system. There is a guide here. The latest library can be downloaded here, and it can be configured and compiled with the following shell command. To avoid a make error later (see the end of this article), we will install the latest version (3.2.1 at this time). Firefox reports that it needs libffi 3.0.9 or higher. We will actually install 3.2.1 because it is a dependency of GLib which we will upgrade later. Firefox will be using GIMP Toolkit 2 (GTK+ 2), so let’s install that now. DEBUG: configure: error: yasm is a required build tool for this architecture when webm is enabled. You may either install yasm or --disable-webm (which disables the WebM video format). See https://developer.mozilla.org/en/YASM for more details. Firefox doesn’t display helpful messages for CentOS/RHEL users. For example, “Can’t find X headers (install libxt-dev (Debian/Ubuntu), libXt-devel (Fedora), or xorg-x11-libXt-devel (SuSE))“. If you enable more options in mozconfig, you can search for the right packages with yum search or yum whatprovides. I’ll save you the trouble of compiling Firefox only to discover after 24 minutes that you need to upgrade GLib. A make error may happen related to GLib (not Glibc). There is no warning in the configure stage, but GLib version 2.30 or higher is required. I know this because the symbol g_unicode_script_from_iso15924 is new in version 2.30. This took a bit of research. When installing glib-devel.x86_64 via yum, the highest version on CentOS 6.8 available is 2.28. We need 2.30 or higher. Just to be safe we’ll install GLib 2.44.14 because it itself requires libffi 3.2.1 and Python 2.7.10, both of which we just installed. If you install glib > 2.44.1, you will need a higher version of Python than we installed earlier, and may need a higher version of libffi as well. You may have noticed the installation of docbook-style-xsl. This took a while to investigate, but installing it solves a build error related to needing to download an XSLT stylesheet that cannot be found as it creates a local copy instead. This took some research too, but long story short, run yum install -y libXdamage-devel.x86_64 to install the Xdamage headers. Finally we can build Firefox. This is going to take a very long time5. 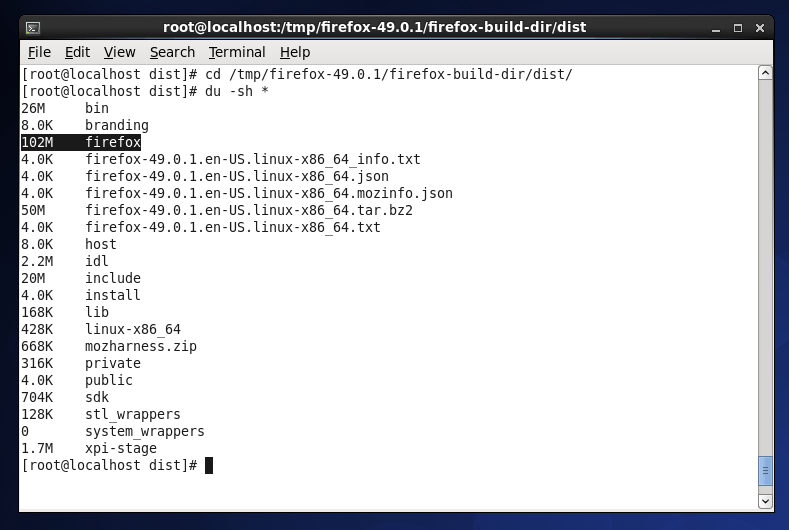 First, configure Firefox to check for any additional dependencies that are missing. If there are any missing dependencies, please add them as needed. Hopefully there wont be any more unless you are compiling a different version of Firefox, or the mozconfig settings have changed. Let’s build Firefox now. Hopefully you will get a message like the following. It took over 1.5 hours to build Firefox on an i7 with just one core dedicated to the VMWare machine. 97:43.19 945 compiler warnings present. 97:59.46 Notification center failed: Install the python dbus module to get a notification when the build finishes. 97:59.46 We know it took a while, but your build finally finished successfully! To view resource usage of the build, run |mach resource-usage|. Our official builds are packaged before shipping, which entails stripping (among many other things). You can produce a packaged build by running “./mach package” in your source directory or “make package” in your object directory. Thus, run ./mach package. You should find something similar to the following. The uncompressed Firefox build we just created is only about 100 MB. Much more reasonable. Upload the whole /dist folder to the shared host. Now let’s see the shared libraries our shiny new build of Firefox requires. So we know right away the main binary requires us to bring over libstdc++.so.6 to the shared server because it is in the /usr/lib64 folder. You can try to dereference the symlink to that binary and upload it manually now, or you can wait a few moments for a more automated way. On your shared server you can set the LD_LIBRARY_PATH environment variable to some location in your home folder where you will store your libraries (e.g. ~/lib64). All the dependent shared libraries will be combined into the base of a tarball named libxul.so.tar.gz. Notice that /usr/lib64/libstdc++.so.6 is included as well, so that is why we skipped copying it earlier. Upload the Firefox /dist folder and all the shared libraries, set the proper environment variables (i.e.. PATH, LD_LIBRARY_PATH) and Firefox should now run on a shared host. Using Xvfb and Firefox you can test if the installation works. Here is a sample out from the build I made above. The script firefox-version.sh just contains firefox --version to show the version number and exit Firefox gracefully. There we have it.